Part con artist, part gunslinger, and part cantina brawler, the Scoundrel is quick-witted, quick on his feet, and quick to get himself into a great deal of trouble at the drop of a hat. He doesn't care one whit for rules or laws, except where he can use them to work an angle. 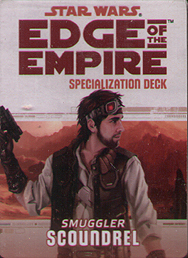 This deck requires the Edge of the Empire Core Rulebook and includes cards for all 20 talents available in the Smuggler specialization.